The Farmers Weekly Awards 2017 finalists have been announced and the judges have visited each of them for a three-hour interview and tour. All three finalists have livestock in their rotation, are improving soil health and have made technical changes resulting in their arable businesses being better placed for life after Brexit. Richard Allison reports. Nestled between the fruit orchards in north Kent, sheep have made a return to one arable farm’s rotation to tackle pockets of blackgrass thriving on the heavy soils. On the 1,169ha of cropping, herbicide-resistant blackgrass has become a persistent problem in some fields, explains Mark Bowsher-Gibbs. 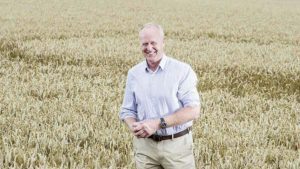 “However, we can’t rely on spring cropping because of the dry [spring] climate.” So in the six years since joining GH Dean, he has adopted other measures such as growing competitive winter barley and sheep. Another challenge is shrinking margins because of the low grain prices, something that needed tackling for life after Brexit. Mark has focused on cutting costs, which culminated in a major change in establishment system three seasons ago. He moved from min-till to a lower-disturbance establishment system based on a Tilso Straw rake, to manage stubbles, and a 6m Sumo DTS strip-till drill. He estimates this has slashed establishment costs by £50/ha, through a combination of using less fuel use and reduced labour. The result is that he can grow wheat for less than £100/t. Mark has also improved efficiency by harnessing technology, such as variable rate seeding to produce more uniform crops on his variable soils and push yields. His first wheats now average more than 10t/ha and last year saw the farm’s highest yield of 11.7t/ha. He has diversified cropping introducing crops such as soya and peas, as well as adding value where possible including milling wheat and beans for markets in Africa. Mark has brought sheep back in the rotation in two ways, first grazing two-year leys of Westerwold in the really bad blackgrass fields and grazing oat catch crops before peas. The 1,500-ewe flock, which lambs in early March, also graze areas of higher level stewardship. Finally, soil health has improved since he introduced a 10m controlled traffic system to help reduce trafficking. “We find that we can get on with the sprayer earlier in the season,” he says. Mark continues to innovate and is gaining from being an AHDB Monitor Farm, hosting open days and on-farm trials. One trial is comparing different direct drills with a view of possibly moving to no-till. In conclusion, the combination of cutting costs, harnessing technology, adding value and improving soil health means the farm is better placed for life after Brexit. Mark is open to new ideas and has dramatically changed the business in the six years since joining. He has built a strong team and is seeing success in tackling blackgrass. Nineteen years ago when wheat was only selling for £75/t and rapeseed at £115, John Pawsey faced a difficult decision to bring the farm eight miles south of Bury St Edmunds back into profit. “It felt like the farm had got bogged down,” he says, referring to the 100% winter cropping system. In 1999, he converted part of the farm to organic so he could compare both approaches. “The organic system generated a £150/ha higher margin.” So he converted the whole farm, seeing it as a financial diversification. “Many at the time said it could not be done on this soil type,” he recalls. But he proved them wrong and has developed a system that is delivering impressive margins on his heavy land. He opted for a longer fertility building phase with a two-year grass/clover sward, which is where his 850-ewe flock of New Zealand Romney sheep come in, grazing the swards in the second year. High-value crops such as quinoa (pictured) and spelt for specialist breads were promoted to the first position followed by spring oats, winter beans and spring barley. Wheat is only grown on the contract farms and he selects varieties from the AHDB Recommended List, offering good disease resistant and untreated yields. Keeping weeds out of the rotation is vital and he employs a combination of growing competitive crops, mechanical weeding and hand rouging. However, John sees the introduction of the Swedish-built low-disturbance Cameleon drill as a key turning point, helping with establishment. It also works as an inter-row mechanical weeder. The result is his yields are impressive with a top organic wheat yield of 7t/ha and spring oats typically deliver 4.5-6t/ha. Marketing is equally crucial and John along with other farmers established Organic Arable. The company supplies British Quality Pigs with feed, which sell under the Duchy brand in Waitrose. John continues to innovate, he is investigating bi-cropping and is trialling a grain analyser to map grain protein levels in a field. So it’s no surprise he has successfully expanded his cropping area, taking on five contract farms. Some of which he secured through a bidding process going against conventional growers. John has a passion for what he is doing and is open to trying different things. He learns from mistakes and is successfully farming a big area organically. Taking pride of place in the kitchen cabinet are two gold awards earned by Shaun Watson for producing the UK’s highest-yielding wheat crop last season. The awards from Adas’s Yield Enhancement Network (YEN) are for producing a 12.8t/ha crop and the best potential yield. About six years ago, Shaun recalls that the family were unable to expand the area farmed, so the challenge was to raise yields in order to increase output. Adding to the challenge are the highly variable soils, not helped by the coal mining legacy. Technology has played a key role in driving yields with variable rate NPK fertiliser applications. But he believes variable seeding has been the real step forward by helping even up crops, rates vary from 280 to 350 seeds/sq m.
Soils range from light land on the coast to heavy yellow clay, some fields have four or more soil types. Farming in a wetter area means ploughing and regular subsoiling is essential. He tried min-till, but saw a 0.5t/acre penalty. Yields are also helped by a diverse rotation, which includes ryegrass leys for the haylage. Soil P and K indices have been transformed even in the short time since its adoption. The result is that crops are much more even, pushing the averages up with wheat close to 11t/ha. He believes in healthy soils and feeds them with liberal amounts of sewage sludge, horse manure from the livery business and compost. Soil organic matters are in excess of 5%, which direct drillers would be envious of. However, his one big threat is blackgrass and he goes to great lengths to keep it out, such as using no contractors and only applying muck from horse owners who buy hay and straw from Shaun. His success and reputation has helped him to substantially grow the area from 280ha in 2013 to 730ha this season. Ultimately, he believes “yield is king” and his philosophy of driving yields up and keeping costs down is the key to arable businesses surviving after Brexit. Diversifications are also crucial with haylage for local horse owners and horse livery. “Last year, we wanted to buy a farm to help future-proof the business, as we are being squeezed by new housing developments.” So the family bought a farm near Morpeth. It’s a 10-year-plus project constructing a new yard for the farm business with the eventual aim of taking land further north. Shaun is enthusiastic and is achieving high yields with a plough-based system. He has seen impressive expansion and his crops stand out from his neighbour’s.